KONTAK PERKASA FUTURES - I’m belted into the driver’s seat, rolling along Los Angeles’ furiously busy 405 freeway on a Tuesday morning, keeping pace with the surrounding traffic at a slightly extra-legal 70 mph. There is a car within feet of me on either side, another one two car lengths ahead, and a fourth—its driver clearly hyper-caffeinated—so close behind it is apparently trying to park itself inside my trunk. Me? I’ve got both fleet flat on the floor, my arms are folded in my lap, and I’m watching all the surging, shuffling madness around me with a strange, newfound sense of serenity. And why wouldn’t I be? After all, the Cadillac I’m sitting in is driving all by itself. KONTAK PERKASA FUTURES - Welcome to the brave new world of Cadillac Super Cruise. Launched last fall on the manufacturer’s up-level CT6 sedan, Super Cruise is Caddy’s new Level 2 semi-autonomous driving feature. A $5,000 option on the Premium Luxury CT6 and standard on the Platinum edition (the model I was driving), Super Cruise is arguably the most sophisticated automated-driving system now on the market. Unlike similar systems from makers like Tesla, Volvo, and Mercedes-Benz, Super Cruise does not require the driver to keep a hand or two on the wheel most of the time. Instead, it can drive entirely by itself, unassisted, for hours and hours—at least on the right kinds of roads. At the moment, that means roughly 130,000 miles of divided highways in the U.S. and Canada that General Motors has mapped specifically for Super Cruise driving. It will not change lanes or follow GPS instructions—at least, not yet—but it will motor along within a specific lane for the duration of the highway portion of your daily commute. Sound intriguing? You bet it does. Having sampled the semi-autonomous systems in Teslas, BMWs, and others, I was not fully prepared for the fully “hands-off” experience of Super Cruise. So, on the 405, when I engaged the system for the first time, my hands hovered over the wheel and my right foot dangled above the brake, prepared at any instant to take control from what I fully expected to be a runaway machine. Within a few miles, though, my right foot was resting on the floor and my hands were in my lap. The CT6 was driving beautifully. Following the car in front, it accelerated and braked as-needed to maintain a preset distance, while the steering wheel moved almost miraculously, keeping me solidly within the lane stripes even during tight-ish turns (it managed to stay in-lane far better than other systems I’ve tried, which tend to bounce from right stripe to left and back rather than track mid-lane). When another driver suddenly jumped into the narrow gap in front of me, the CT6 braked strongly but smoothly, keeping me a safe distance behind before accelerating back up to speed (for now, Super Cruise is just a tad slow on regaining the throttle, so other drivers are quick to pounce in front before you’re back to cruising speed—but it’s a minor issue). The system doesn’t use onboard lidar but instead relies upon cameras and those highly accurate maps GM has pre-made. Never once on the freeway did it ask for me to retake the wheel—but then, I was behaving and looking out the windshield. If you don’t—say, you start to read a book or turn to talk with your passengers in back—a camera sensor on the steering column will notice and Super Cruise will start yelling at you. Ignore it long enough and Super Cruise will stop the car right in the middle of the lane. That’s right: it will stop right there on even the busiest freeway. Which should terrify any Super Cruise pilot into always paying attention—but may also terrify anyone who ever finds themselves behind a CT6. Overall, Super Cruise proved amazing. I let it drive me around for several hours and never did I feel apprehensive. And it did take a lot of the stress out of dealing with rush-hour traffic. I’d bet a lot of CT6 shoppers will gladly pay $5,000 for the services of a capable robot driver. Super Cruise is that good. As for the CT6, this is a generally fine luxury sedan with a few annoying shortcomings. The power is certainly there: 404 horsepower from a twin-turbo 3.0-liter V-6. The car rides well, steers nicely, and offers a bounty of sophisticated conveniences. On the other hand, at $89,290 for the fully loaded Platinum all-wheel-drive model, the interior doesn’t feel appropriately expensive. It is leather-lined and comfortable, but not nearly as dressy as, say, a Mercedes-Benz S-Class’s cabin. Too many switches and pieces seem to have been lifted from Chevrolet’s parts bins. And then there’s the CUE infotainment system. Pure nightmare. Simply adjusting the radio station requires enough screen presses to induce a headache (thankfully, Super Cruise does the driving while you do the cursing). The touchscreen pad on the center console doesn’t help; it’s too sensitive and almost impossible to use on the move. The CUE system is particularly annoying because the CT6 Platinum is such an otherwise engaging machine. It’s smooth, powerful, pleasing to drive, quiet inside, and loaded with really impressive tech. But the lousy interface means you constantly bump up against a frustrating wall. Against all the complexities of making a great powertrain, a sophisticated chassis, and advanced active-safety systems, shouldn’t the multimedia interface be the easy part? 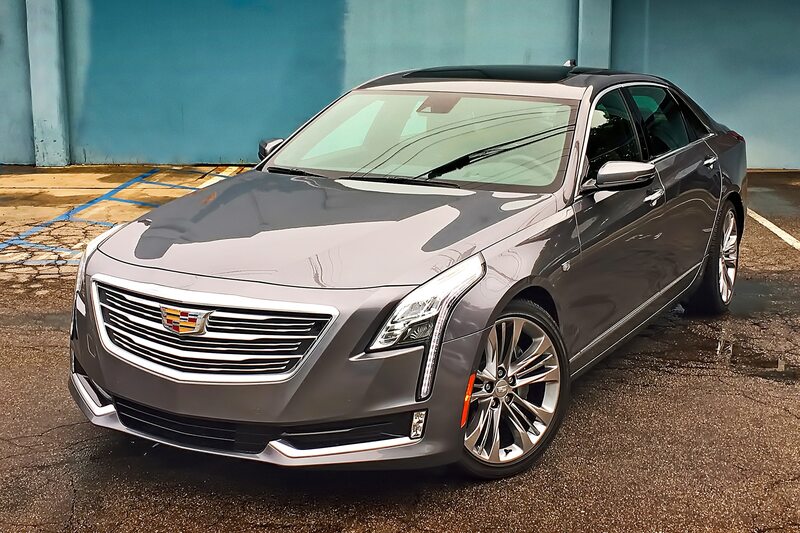 That one fix could elevate the CT6 Platinum from a very nice luxury sedan to an extremely compelling one. Meantime, without doubt, Cadillac has a winner on its hands with Super Cruise. That feature alone may be more than enough to draw plenty of buyers into the CT6 fold. Because for now, anyway, the best robot driver in town lives at the Cadillac store.